Unlocked motor vehicles were entered outside five Darien homes on Richmond Drive, Mansfield Place and Woods End Road (all within a mile of each other on the west side of town) overnight Wednesday to Thursday, Jan. 30 to 31. A 33 Richmond Dr. resident was woken just before 3:08 a.m. (when police were called) by the sound of his car alarm. The resident looked outside to see two males near one of the vehicles in the driveway. They ran into a waiting vehicle parked on the street. The alarm had been sounded when a door was opened on the resident’s unlocked Cadillac CTS station wagon. It appeared nothing was missing. 11 Woods End Road — thieves passed up a perfectly good opportunity to steal a 2018 Toyota Tundra pickup truck, although they did steal the vehicle’s keys, conveniently left in a cup holder. 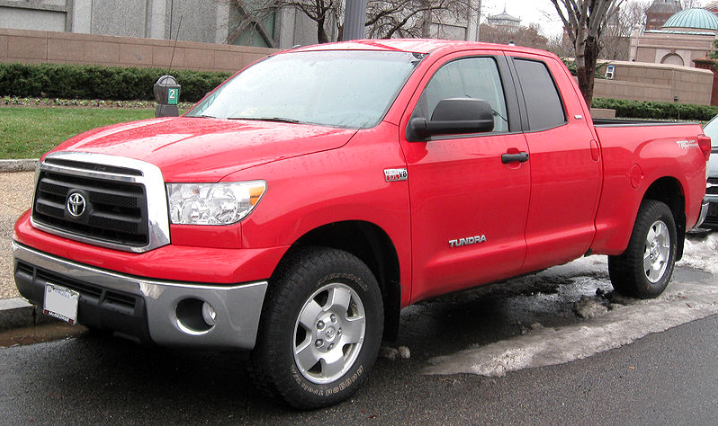 The 2010 model Toyota Tundra pickup truck. What is the matter with a vehicle that thieves would pass up the opportunity to steal a 2018 model from the driveway of a Woods End Road home last week? And why would they steal the keys and not the vehicle itself? The Tundra, along with a 2017 Acura MDX, were entered, and the glove boxes and center consoles were opened. A resident reported the incident to police at 7:26 a.m., Thursday. Police conducted a canvas of other residents on the street on Thursday morning and found more vehicles had been entered. 8 Woods End Road — During the canvas, officers found at 7:53 a.m. that a 2015 Land Rover had been entered. Interior compartments had been opened but nothing appeared to be missing. 2 Woods End Road — At 11:26 a.m., police found another 2015 Land Rover, along with a 2017 BMW X5 were entered, with interior compartments opened but apparently nothing missing. 2 Mansfield Pl. — At 1:35 p.m., Thursday, the owner of a 2017 Land Rover told police the interior compartments of the vehicle were found ajar, but nothing seemed to be missing. Two vehicles were entered in the same area on the west side of town, possibly the same night, resulting in the theft of one tool, and another vehicle parked in the lot at Trader Joe's was entered by someone who stole things from the trunk, Darien police said. Police described what happened in each case with these accounts: 1 Fresh Meadows Lane The owner of a 2015 Jeep Wrangler left it unlocked in the driveway at 1 Fresh Meadows Lane at about 10 p.m., Saturday, Feb.